Weeds fascinate me. I aspire to be a weed. Annuals and perennials aren’t for me. Sure they have a purpose and serve it well but they’re not for me. Annuals are pretty, and grow in many beautiful colors and are pleasant to look at. But they’re fragile. If the conditions they’re planted in aren’t exactly perfect, they wither and die. Even when the planting conditions are favorable and they get the right amount of sun and water, they only survive for a season and then they’re gone. Perennials require a lot of the same pampering as annuals even though they are much more hardy. They will come back for a few seasons but even they are susceptible to drought, cold and heat and other less favorable conditions. But weeds have the secret to survival. They are tenacious, strong and resilient. No matter what comes at them….no matter what is done to try to eradicate them, weeds never give up. They hold on. Even if you mow them down, poison them or pull them up by the roots (or at least you think you do), they continue to grow. It’s almost as if they laugh in the face of what is trying to destroy them. They adjust and adapt to the conditions. Whether they are in full or part sun, shade, drought, cold or heat, weeds adapt. Some weeds are even pretty and have earned a place as grass, ornamentals, medicine and flowers of choice rather than something that we have the desire to eliminate. It’s almost as if weeds know they have a purpose and are going to do everything within their power to survive and serve that purpose. You may even call it destiny. They don’t fit in with the crowd. There is always something just a bit different about them. I’ve known people like this. I call them trendsetters. 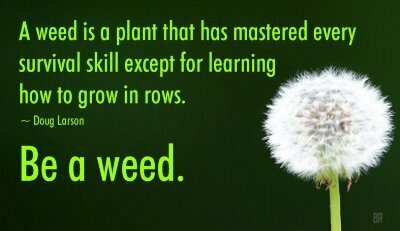 So why not be a weed? A tenacious, strong, resilient trendsetter that laughs in the face of anything that tries to destroy you or keep you from fulfilling your purpose and destiny. Tagged annuals, Destiny, direction, Goals, Life, Lifestyle, perennials, purpose, stay strong, strong, survival, trendsetter, Vision, weed. Another keeper Patrick!!! Some of it is even ‘ a paste it to your forehead so you see it when you look it the mirror’ !!!!! Thanks.